Exhibition 'Sotheby's: 10 Years in Russia' at the State Russian Library. London-based auction house Sotheby’s has marked a decade in Moscow with a one-day exhibition “Artist's view.” On May 24 the State Russian Library exhibited more than 40 works of art bought by Russian collectors at Sotheby’s auctions, as well as top lots of forthcoming sales of Russian art in London. Sotheby’s debut sale in Russia was held during Soviet times in 1988. The top lot of that auction was Grisha Bruskin's painting “Fundamental Lexicon”, which sold for $500,000. It would be another 20 years before the auctioneers opened a Moscow office. 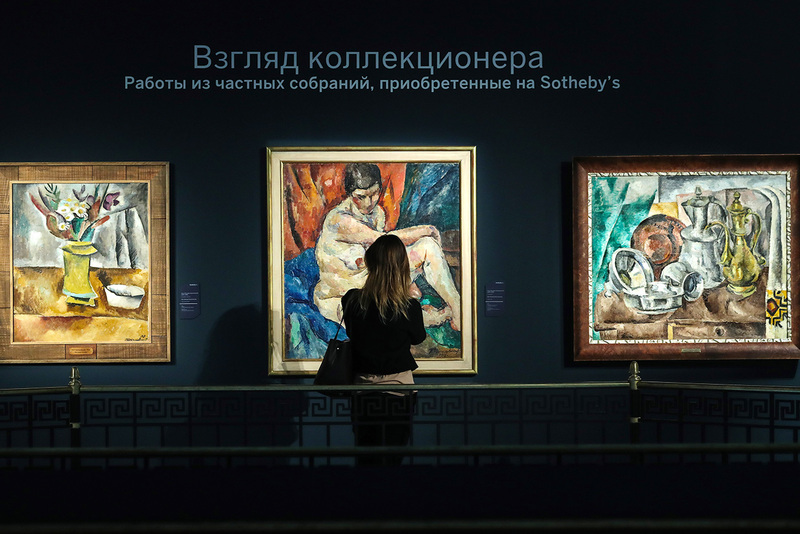 From 2007 onwards Sotheby’s brought more than 20 exhibitions of international fine art masterpieces to Russia, and the numbers of Russian collectors and dealers participating in its international sales increased by 30 percent. Russian art sales in London turned from exotic sideshows to prestigious and profitable events. RIA Novosti has put together a list of the most expensive Russian lots sold by Sotheby’s. Scandal attended one of the first Sotheby’s auctions in Russia in 2007. The sale was canceled at the last moment when all lots were sold to a private collection. It was later reported that Russian billionaire Alisher Usmanov had purchased the collection of composer Mstislav Rostropovich and his wife opera singer Galina Vishnevskaya. Usmanov donated the collection of 450 items to the Konstantinovsky Palace (known as the 'Palace of Congresses') in St. Petersburg. The sum Usmanov paid has never been revealed, but is believed to be much more than initial auction estimates of $26-$40 million. Works of the Russian avant-garde have long been in high demand. One of Sotheby’s record sales was that of “Suprematist Composition” by Kazimir Malevich, best known for his 1915 work “Black Square”. The painting was sold in New York in 2008 to an unknown buyer for $60 million, the most ever paid for a Malevich work at auction. At a 2011 auction dedicated to the 50th anniversary of man’s first space flight, a unique lot went under the hammer – the capsule of Soviet spacecraft Vostok 3KA-2, which in 1961 orbited the earth with a dog called Star and a humanoid mannequin named Ivan Ivanovich on board. The successful return to earth of the spacecraft laid the ground for Yuri Gagarin's later manned flight. The piece of space history sold for just under $3 million. A collection of artifacts devoted to the life and art of famous Soviet filmmaker Andrei Tarkovsky, went under the hammer at a London sale with a total estimate of £80-£130,000 ($100-$130,000). Intense interest from bidders brought in more than ten times that, with an auction total of £1.3 million ($1.6 million). A representative of Ivanovo Region, where the director was born, bought the archive for his museum with the help of donations collected by International Tarkovsky Film Festival Zerkalo (“The Mirror”), private sponsors and local authorities. Selling a painting “Study of a Sleeping Girl” by Zinaida Serebryakova for £3.8 million ($4.9 million) in 2015 brought fresh interest to an artist who had been all but forgotten during Soviet times. The price was three times higher than those achieved for her paintings in recent years. “Sleeping Girl” remains the most expensive of the artist's works sold at auction. Because it was bought by an anonymous collector the painting is not among other works currently on show at a retrospective of Serebryakova's work at Moscow's Tretyakov Gallery.